The news that a sea otter pup was euthanized by sea otter rescuers from Monterey Bay Aquarium touched many people. This is the sad reality of the decisions wildlife care professionals must wrestle with all the time. It is a taboo subject that The Otter Project made a conscious decision to open up for discussion. Certainly, there are times when an animal is in horrific pain, cannot be saved, and humane euthanasia is the best option. But, that is not what we are discussing here. This was a young pup that was euthanized because of “capacity” issues. We all are sad when this happens perhaps because we feel we failed somehow. As we discuss this issue, let’s be civil. The people and institutions that are on the ground and in the water who wrestle with these issues are wildlife heroes. Period. So, let’s discuss solutions. Rescuing sea otters has several bottlenecks. 1) The number of rescue and recovery facilities; 2) the capacity of facilities where non-releasable otters can receive long term care; 3) and ultimately, money. The number of rescue and recovery facilities. Southern sea otters are listed under the Endangered Species Act (ESA). A consequence of this is that possession of an otter (or any piece or part) is very strictly regulated by the US Fish and Wildlife Service. On the California coast the very few rescue and rehabilitation facilities primarily include The Marine Mammal Center, Monterey Bay Aquarium, Sea World, and California Department of Fish and Wildlife division of Oil Spill Prevention and Response. By far, Monterey Bay Aquarium is the primary focus of sea otter rescue and rehab. Because sea otters need special enclosures, clean water, near constant enrichment activities, and a huge volume of fresh seafood, their care is incredibly expensive. In addition, young pups require nearly 24 hour care. Otters seem to readily imprint on people, resulting in varying degrees of successful release; but successful releases have happened (e.g., about 360 otters were rescued and treated at rehabilitation facilities after the Exxon Valdez oil spill. Of these, 195 were successfully rehabilitated and released (Baldwin, 1991)). Starting in 2005, Monterey Bay Aquarium began using surrogate sea otter moms to care for pups. Because human interaction could result in imprinting and making release difficult, tanks for the surrogate program cannot be part of the public display (adding expense). The number of surrogate moms is limited by a number of factors including space and costs. Solutions: 1) Additional facilities could be encouraged to keep surrogate sea otter mothers. Even if additional surrogates were available, there would most likely still be times when no surrogate were available, and it’s likely that some fraction of the surrogate-raised pups would be non-releasable. 2) Although good people have tried very hard, for years, to increase rehab and release success rates, too often older rehab otters especially end up being non-releasable and must be recaptured and placed in long-term care, but generally, there is no facility available to take in these otters. The capacity of facilities where non-releasable otters can receive long term care. A recurring theme is the expense of keeping sea otters. Public aquariums can recover their expense through tickets, but the space, dedicated staffing commitment, feeding expense, and technical knowledge make these types of programs difficult to operate. As of March 2013, there were 19 northern and 32 southern sea otters in captivity in North America, at 14 public aquaria and 2 research facilities. These facilities are generally at capacity; there is no room at the inn. Solutions: 1) An obvious solution would be to create a dedicated facility to house a large number of non-releasable sea otters. Such a facility would be incredibly expensive, but was considered several years ago. Such a facility could have dedicated surrogate sea otter mom tanks, shorter-term rehab and release tanks, and long term care tanks. Such a facility would cost many many tens of millions of dollars and would have incredible operating expenses. Again, while this is an obvious answer, it was looked at several years ago and deemed unrealistic. This doesn’t mean it should not be revisited. 2) Overseas public aquariums would be willing to take sea otters, but “export” of southern sea otters is difficult under the ESA and US Fish and Wildlife Service permitting. As a consequence, it is easier for overseas aquaria to trap and trade unlisted populations, or breed unlisted captive otters, rather than to take ESA listed southern sea otters. The Otter Project is flatly against trap and trade and we are currently against captive breeding because it fills the capacity that could be used for a non-releasable rehab animal. Placement of southern sea otters in overseas aquaria is perhaps the easiest (albeit still difficult) capacity issue to address. Money. This topic has been pretty well covered above. Feeding – the cost of the food alone – has been estimated at $20-$40,000 per year for a single otter. That expense does not include the capital expense, staff, veterinary costs, maintenance, etc. And this is just the “care” of the otter once it is in captivity; the cost of rescue is also very significant sometimes involving teams of people (sometimes volunteers), boats, transport, short-term holding tanks, and veterinarians. The incredible expense should not be offhandedly dismissed, the expense would be huge and ultimately would need to be evaluated against spending the money other ways, such as solving the problems that exist in the wild. I expect this post could disappoint some, as there is no easy answer. The Otter Project is dedicated to addressing the difficult issues and sometimes we risk being controversial. There just aren’t any easy answers and open discussion is a means to find our way. We are concerned and looking forward to hearing discussion and the wisdom of the group. Please join the discussion on Facebook www.facebook.com/otterproject . 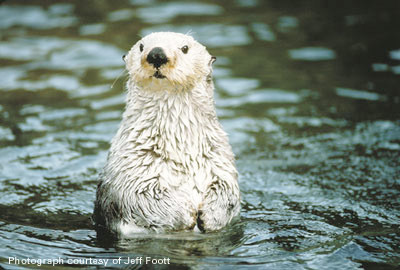 You are always welcome to contact me directly with your thoughts: Steve Shimek, Executive Director, The Otter Project, PO Box 269, Monterey, CA 93942. exec@otterproject.org . 831-663-9460. This entry was posted in California, conservation, Mini-controversies, Outreach and Awareness, Uncategorized and tagged sea otter rescue. Bookmark the permalink.